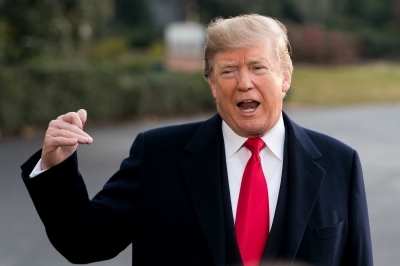 Washington, Dec 8 (IANS) US President Donald Trump once again railed against the Paris climate deal on Saturday, claiming that the ongoing riots in the French capital were taking place because the citizens there didn't want to pay "large sums of money, much to third world countries". His comments came as world leaders gathered in Poland for the UN climate change conference (COP24) in which key aspects of the 2015 Paris climate agreement were set to be implemented. "The Paris agreement isn't working out so well for Paris. Protests and riots all over France," Trump said in a tweet. The US leader also claimed that the protesters in Paris were "chanting 'We Want Trump!'" The President, earlier this week, cited the riots as justification for pulling out of the climate deal, calling it "fatally flawed". Washington pulled out of the landmark deal in June 2017, saying that the "unfair" accord would have imposed "draconian financial and economic burdens" on the US, as it would have made the country pay for nations which benefited the most from the deal. That time he had targeted India and China, saying both these nations were benefiting most from the Paris deal, which was "unfair" to the US.